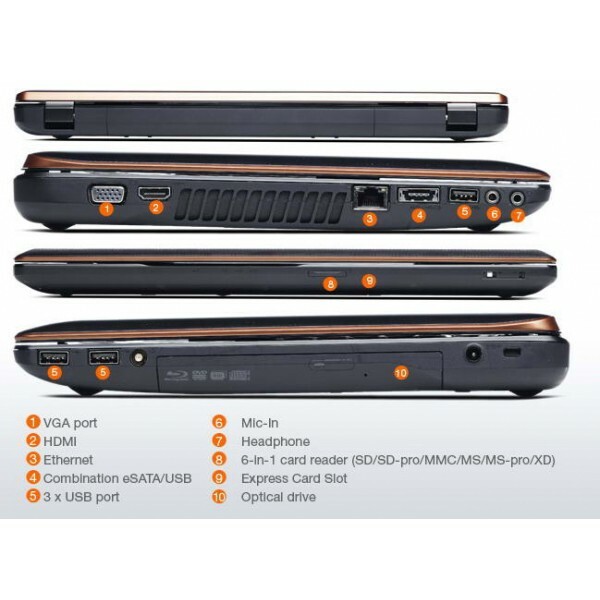 Lenovo Ideapad Y570 is a product that is quite interesting with a variety of security features embedded in it and also strengthen the product that is already in production earlier in the series Idepad. Quite interesting also for the cover is complete and you can find the descriptions below in detail. This product uses the 2nd generation prosesorIntel work harder and longer durability compared to Intel Arrandale is in use on the previous product. screen size 15.6 inch LCD with 1366x768 resolution using black casing and aluminum straight line with a dot on the LCD cover. Dimensions of the screen is wide enough look so great with standard thickness. On the outskirts of Orange color LCD there is a line that looks interesting and not monotonous. Finishing on the handrest using a melted aluminum with gray color so as to create a young Purple color when exposed to light. With an Intel Core i7 2630 Sandy Bridge and 4GB of DDR3 SODIMM memory can be upgraded 8GB if needed. 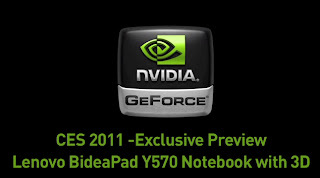 This notebook is high performance, using a top-class processor and graphics memkai NVIDIA GEFORCE NVIDIA Optimus GT555M equipped to make the higher the power of his life. 750GB Hard disk storage is ready to accommodate a variety of multimedia and data files, data storage was large enough. Lenovo is already equipped with Windows Enchaced Experience 2.0 makes Windows 7 so fast loading. Lenovo Ideapad Y570 is created for entertainment that requires a notebook with superior performance specifications and the big screen. For the keyboard, the Lenovo Ideapad Y570 chicklet design uses a slightly modified so that its shape is not too box and has a notch at the top. 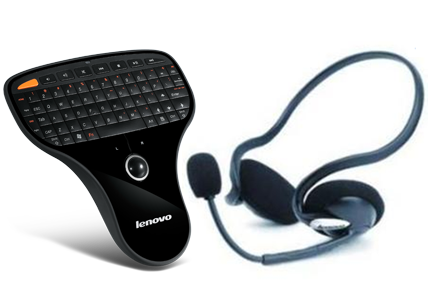 In our opinion, the keys feel a little hard but still comfortable to use and silent Ketka we use to type with a high tempo. Trackpad has given a large enough room so that your fingers can move freely while performing multitouch gestures. Left and right click functions also feels soft and no noise. At the top of the keyboard, there are a variety of shortcut keys to access the volume control, Power Management and Thermal Management which serves to control the cooling fan. One of the highlights is "dedusting" mode to clean the dust off the heatsink. In this mode, the fan will spin very fast to clean dust from the heatsink. 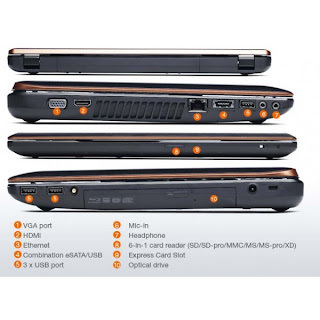 A given port on the left and right spread Lenovo Ideapad Y570 notebook and can be equipped with the presence of 2 USB3.0 ports and an eSATA combo pieces with USB2.0 as much as a fruit. on the front, you'll find two switches. The first is used to turn off and turn on WiFi and the second is used for graphics (not to switchable graphics, but rather to maximize the graphics work). Later, you'll get two options, save or optimize power and performance. When you want to save the battery, you can choose to optimize the GPU is not going to run an application and you can see the indicator of whether the NVIDIA GPU is running or not. 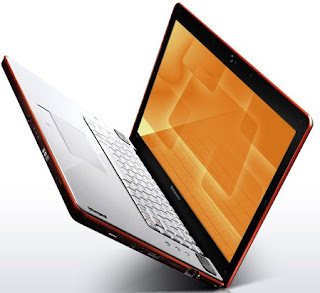 Lenovo Ideapad Y570 using a glossy screen will be slightly disturbed by the surrounding shadows. However, you can minimize it by raising the level of brightness. Viewing angle is also quite good because the screen does not change the excessive degradation of color when viewed from the left and right. Degradation of the display will change color when you see it from above. 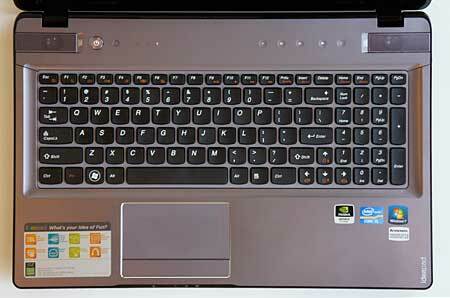 The speakers are placed at the top of the keyboard. 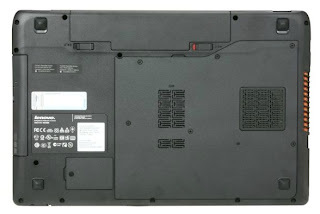 The speakers are installed in this notebook is the production of JBL, a well-known speaker manufacturer. To watch and play the game performance is pretty good. But do not feel the thumping bass. This is understandable because the JBL bass speakers are not included in this notebook. 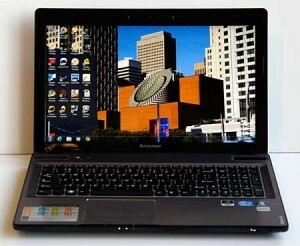 Lenovo's performance is high. You can run a top-class applications with quite smoothly. 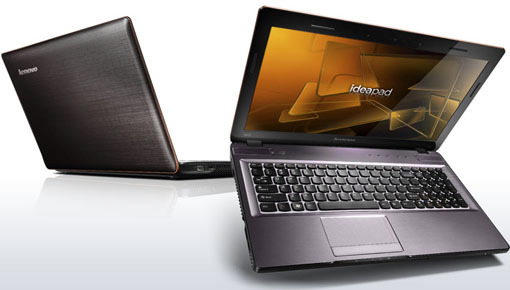 Given these values ​​for the Intel Core i7 2630QM is the average value of a notebook with a similar processor. Battery power is used by 62 Wh, and can turn on the notebook is up to 362 minutes or the equivalent of 6 hours 2 minutes. The results make us raise the thumb, given the specifications and carried a large screen notebook. With these results, you do not have to worry about running out of battery power while on the go. Transcoding process is also quite fast and will run faster if you use an application with support for Intel Quicksysc. You do not have long to wait for the results when trying to insert data into the gadget be it a tablet or smartphone. 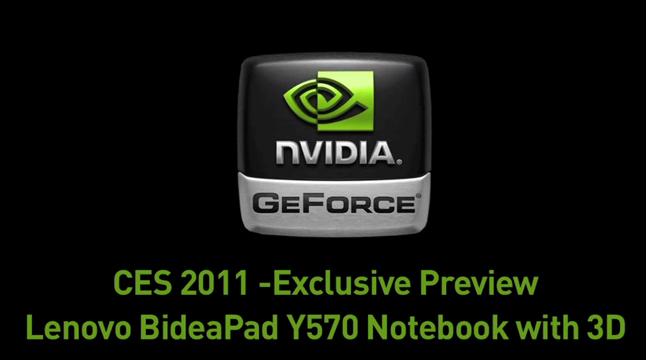 Graphics performance of NVIDIA GeForce GT540M membangggakan enough. With the results of the above, you will be able to play a 3D game with a good variety in the setting of the high and specific resolution. With the capabilities that exist in DX11 graphics card that came with the game Lost Planet and Unigine Heaven. When playing the game Lost planet, you can still adjust the settings of the game at native resolution with low DX11 future. In the benchmark systetis Unigine Heaven, you can see the results obtained with a high setting to only 15.1 FPS in the setting of the normal benchmark. In the game Left4Dead, a combination of CPU and GPU make this game run very smoothly at native resolution and high settings of the results obtained are still very comfortable to play because FPS rate above 30FPS performance. While in Left4Dead 2, you must be satisfied to play in setting combined with a native resolution of medium and some high settings. Game Resident Evil 5 also can run smoothly at native resolution with high settings with 8xMSAA future life. FPS gained still comfortable on the eyes because of the lowest FPS stands at 42.6. In this racing game, you can play DX11 at native resolution and with ultra comfortable setting for the minimum value obtained is still above 30 FPS. You have to glance at Lenovo Ideapad Y570 that has the performance and graphics are quite qualified to perform various activities such as running a good middle-class applications, playing 3D games with high resolutions and settings, and can be entertainment machines with large screen display and sound are qualified. Satisfied with the screen if you've given, please use the HDMI port to be connected with large-screen LCD TV to get more satisfaction. High performance, powerful NVIDIA graphics, graphics Switch, Thermal Management, which provided a fairly complete Port, Speaker JBL. Thank you for your visit and read other articles here. Hello, Is this laptop good for a graphic design student? is it compatible with adobe CS5 Photoshop/illustrator/indesign/lightroom? Hello, Is this laptop good for a graphic design student? is it compatible with adobe photoshop, lightroom, indesign,illustrator?